What does organized trade portend for the future of the post–World War II trading order? Are we seeing a transition from liberalism to protectionism? These questions are central to Vinod K. Aggarwal's penetrating analysis of conflict and cooperation in trade among developed and less developed countries. In his examination of the evolution of organized trade, Aggarwal specifically analyses international regimes in textile and apparel trade. The author uses an original theoretical approach to investigate international regimes. Why are regimes desirable? Aggarwal shows how such accords can protect broader arrangements, allow countries to control one another's behavior, and minimize information and organization costs in negotiations. Several factors account for the form of regimes. The strength of regimes is enhanced by an asymmetry of international power. A hegemon is more willing and able to maintain a regime. Both the nature and scope of regimes are determined by the relative degree of trade competition and cognitive consensus among actors. As trade competition increases, and actors decide to link related issues, regimes become more protectionist in their goals and wider in their coverage. Aggarwal's theory successfully accounts for the transformation of international regimes in textile trade, demonstrating the importance of systematically incorporating international level factors into our theories. His empirical work is based on extensive archival research and interviews with key negotiators. Aggarwal concludes that the pattern of international cooperation which evolved in textile trade provides a portrait of the future for trade in other industrial sectors. 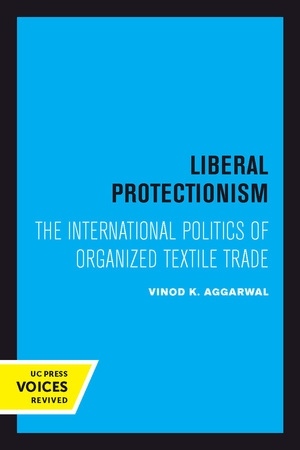 He finds the trend of arrangements in textile trade disturbing and argues that organized trade will not prevent—and may in fact promote a slide from liberalism to protectionism. Regimes originally developed to counter protectionism may evolve into systems of organized protection that encourage neither efficiency nor equity. A lucid analysis of recent historical developments in textile trade, this study sheds light on the movement toward increasing protection in other sectors of trade as well. It is a significant work that will prove valuable to those who study international trade and regimes. This title is part of UC Press's Voices Revived program, which commemorates University of California Press’s mission to seek out and cultivate the brightest minds and give them voice, reach, and impact. Drawing on a backlist dating to 1893, Voices Revived makes high-quality, peer-reviewed scholarship accessible once again using print-on-demand technology. This title was originally published in 1986. Vinod K. Aggarwal is Professor and Travers Family Senior Faculty Fellow in Political Science at UC Berkeley and Director, Berkeley APEC Study Center.